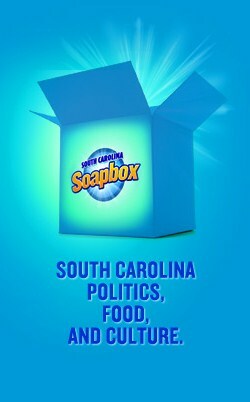 Very excited for my friend Laurin Manning's new SC politics blog, The South Carolina Soapbox! Laurin is a whip-smart political insider whose engaging, highly informed writing has been much missed. Hooray! The SC Soapbox is not just politics, though, as evidenced by this tidy bit on the grass-fed buffalo market. Have you had your buffalo today? Don't you love Laurin's graphic design sense? Sweet. "Trendsetting consumers and restaurants on the East and West Coasts caught on. Grass-fed, sustainable and locally grown, obscure concepts to most people 15 years ago or so when the buffalo meat market first emerged, became buzzwords of the foodie culture. Nutritional bean counters, obsessing over lipid fats and omegas, found in buffalo a meat they could love." Also of note from the article: Media Mogul Ted Turner’s Turner Enterprises is the nation’s biggest buffalo rancher. I did not know that Ted Turner was the nation's largest buffalo rancher. Thanks, Laurin! Here's to widespread success for The SC Soapbox; go check it out!